Preparation for multiplier event started already on April 28, with a promotional event in the "Baltic International Academy" in Riga, where the topic of social entrepreneurship was outlined from the TRY (Together: Refugees & Youth) project. 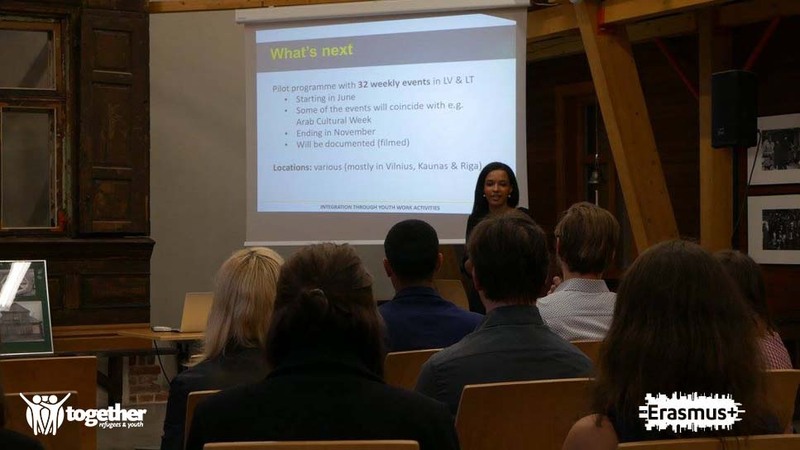 The academy is a leading educational establishment in Latvia, educating social workers who are the main target audience in solving social problems, including the current day issue of integrating refugees from Middle East and other regions of conflict zones. Next step towards the multiplier even was a press conference held on the 8th of June in Europe House, Riga. It showed once again, the fact that refugee integration in Latvia is a hard topic. The project, aims and objectives were presented once again. Multiplier event was held on 20th of May in ‘’Koka Rīga’’ center in Riga. The participants were representing various institutions and backgrounds from Latvia. The introduction of the project was done. Guest speakers were talking during the event with dedicated speeches related to the topic and an active interaction with the auditorium was observed. Dr.V.Šteins was sharing his research work on the youth nowadays and pointing out the importance of intercultural understanding along with the need to understand other cultures. Creative workshops were held, when participants received a practical task to create their own plan of activities for the Pilot Programme for summer of 2017. R. Jansons was sharing his expertise about the Latvian culture space and how if differs from the point of view of immigrants. R. Černis representing the movement of healthy lifestyle talked about the youth future vision and the audience was really active with conversations and discussions. At the evening A.Kazuša, meditation trainer from Peace Revolution movement, run a workshop. Dedicated to the inner peace of each person. That is very important in the case of such a sensitive topic as refugee integration. Participants had a great chance to experience meditation by themselves. Expectations before it and reflection afterwards initiated very positive feedback and created interest on both topics. In summary, the multiplier event showed the way on how to adjust the activities for the Pilot Programme. In order to achieve better results for the aim and objectives. Non formal approach in communication between people from various backgrounds was agreed to be the best way in building bridges and mutual understanding.